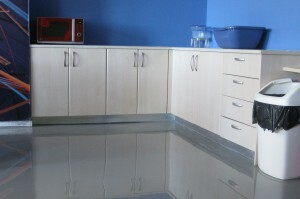 However epoxy floors in homes also come with various problems both during the installation and maintenance process. In most homes we tend to install pre-fabricated flooring materials such as tiles, parquet wood, carpet, linoleum. All these materials have been manufactured off-site in factories under control conditions. They materials arrive on site, where they are attached/ glued/ fastened to the substrate and they are ready for use. Resinous floors work differently. The actual fabrication (curing) of the surface takes place during the installation. This means that conditions are not as controlled. On the one hand curing on-site will enable excellent bonding with the substrate. At the same time however the contractor is subjected to all those unpredictable factors that may arise during the application process. The contractor needs to account for dust, temperature, humidity, quality of substrate just to name a few. Even the presence of insects can create problems on the final surface! Since the floor is seamless, the coating of the final surface must take place in one go, without interruptions. All of the above factors may result in the floor not achieving a 100% perfect surface. Such a surface would be more than acceptable in an industrial facility however people have very high aesthetic expectations (and understandably so), when it comes to their living areas. The maintenance of epoxies is another issue. These floors can be very durable and resistant (which is why they are so attractive for industry) but that doesn’t stop them from scratching and yellowing over the years. So should we be installing epoxies in homes? I have asked several contractors on their opinion and I get very differing views on this issue. Some are in favour of the idea, arguing that we should always be exploring new opportunities and new markets and take a piece of the massive home flooring market. I also speak to very experienced contractors who shy away from such projects. They talk about disappointing experiences to talk about, architects who don’t understand the uniqueness of epoxies or clients who were not happy with the result after they saw it. So now it’s your turn: What do you think? Should contractors be installing epoxy floors in homes?